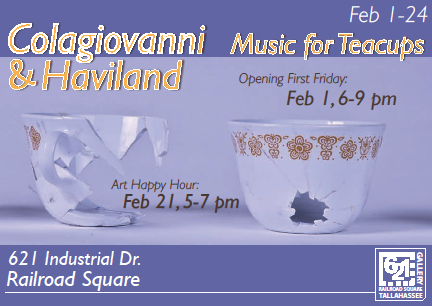 MUSIC FOR TEACUPS, by Ohio-based artists Melissa Haviland and David Colagiovanni. This will be a multi media exhibition, featuring performance on opening night, installation, sculpture, artist books and video. Haviland and Colagiovanni were guest artists at FSU’s FAR technology in the arts facility last year, and some of the work they created then will be part of this exhibition. In the Nan Boynton Memorial Gallery will be FLUIDITY, the FSU Art Student League’s juried all-media exhibition. both exhibits run Feb 1-23. February 16, 1-5 pm is ARTIGRAS, sponsored by Shops and Studios at Railroad Square. 621 Gallery will be participating in the Parade as well as hosting a free maskmaking workshop from 1:30-4:30 that day. February 17, 4-6pm is 621 Salon, the monthly reading series organized by Apalachee Review. February 21, 5-7, is Art Happy Hour, a chance to enjoy art and refreshments during the final week of the exhibits.